Could you try slipstreaming only IE6 cabs and UR2-v3? and the result is triedit.dll 6.1.0.9235. I believe I've found the reason that triedit.dll was not updated. 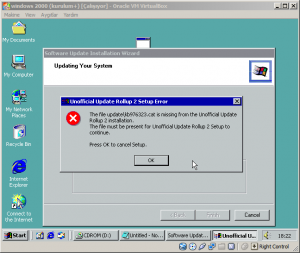 It seems that HFSLIP was set up to do the original update rollup 1 first (I'm not sure why), then the IE cabs files, then the remaining hotfixes. This causes the triedit.dll from your Rollup, because it has the same KB number, to be overwritten by the IE cabs. 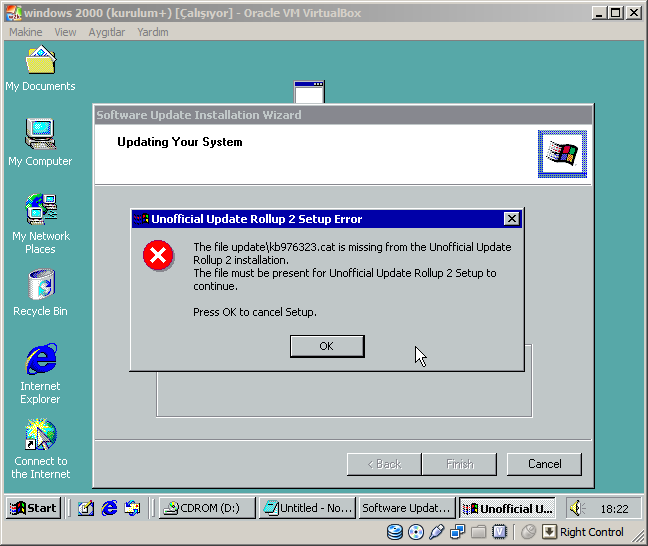 When I changed the name of your Rollup from Windows2000-KB891861-UR2-v3-BETA-x86-ENU.exe to Windows2000-KB891UR2861-v3-BETA-x86-ENU.exe the file was updated and KB956844 disappeared from Microsoft Updates. With that problem fixed I still have one issue with the Rollup. Microsoft Update still asks for KB982381 Cumulative Security Update for IE6 SP1. KB908531 no longer shows up. Update Rollup 1(or 2) being slipstreamed before everything else is a normal HFSLIP behaviour. Still it shouldn't have any influence on triedit.dll. I did a few more tests and the version slipstreamed was always 6.1.0.9235. Are you sure you removed the SOURCESS folder before running HFSLIP? The reason why UR is slipstreamed first is that in contains several Server related files and they are deleted by HFSLIP if your 2K version is Professional. They won't be deleted if you change the KB number (it has to be *KB891861*). I uploaded v3 of Update Rollup 2. Unfortunately I also have bad news. This is the last version of UR2 and I am not going to update it anymore unless bugs are found. Plans for UR2.1 are cancelled. are you leaving the scene? The structure of an update rollup has too many limitations and the need to keep compatibility with HFSLIP also limits greatly my room to manoeuvre. For this reason I decided to focus on a bigger project which will not depend neither on HFSLIP nor on any other 3rd party application in order to be slipstreamed. It's going to take a lot of time (months) but the result should be much more satisfying than now with UR2. Update Rollups are quite easy to make but I need more functions which they lack. To give an example - it's impossible to include Server-only updates in UR2 and keep full HFSLIP compatibility at the same time. The only way to do it would be to modify the HFSLIP itself which I want to avoid as I'm not the author of it. UR2 in this form is kind of completed as it has all of the vital updates included. The only ones left are the buggy updates, Server-only updates and updates for non-default components (MDAC 2.81, WMP9, etc.). i am trying to install v3 on windows 2000 server with sp4 but it fails complaining "the file update\kb976323.cat missing" and cancels setup. this is pristine windows 2000 server with sp4 install. I'm sorry It's my mistake. I wanted to stop WU asking for KB976323 by using an older smtpsvc.dll file with changed version number... but in the end I didn't do it. Unfortunately I forgot to remove the lines referring to KB976323's catalog file. 1. Unpack the Rollup (any archiver should be able to do it). 3. Replace the original "update.inf" file with this one. 4. Run update.exe from the "update" folder and install the Rollup. now it installs ok. thanks. sfc /scannow seems to overwrite some updated files. i've exported the event log. The first problem with WMS files is caused by the hastily added WMS updates and I'll fix them as quick as possible. The bigger problem is with the SFC thing (except for the kernel files related errors which are O.K. as these kernel files have manually changed version to prevent WU ask for KB979683). The rest of these files are IE files and the errors are probably caused by having both IE5 and IE6 catalog files installed. I need a little more time to find a proper way to fix this issue. I also added alternate download URLs which are direct links to Dropbox.